Trusted by 40+ million mobile users, Apple Music might be your primary choice to listen to music on your new iPhone 8/Plus. You know, you can listen to, search, stream and download music from over 40 million songs on Apple Music once you pay $9.9 per month. Yet, the songs from Apple Music won't play if you let your subscription lapse. Cuz the songs you have downloaded from Apple Music are rented, not purchased. Well, you might say: fine, keep subscription alive. Yet, everyone has tough time (if not all time) and you need to reduce expenditures started with non-essential expense like Apple Music subscription. No.1 fast speed to bulk sync music to iPhone 8/Plus from Mac/PC, no iTunes. Copy any music to iPhone 8, iPhone X, e.g, MP3, AAC, AC3, WMA, M4B, ringtone. Remove iTune DRM, convert M4B/M4P to MP3 & add iTunes music to iPhone 8/X. Manage music: create playlist, edit info, delete songs, make iPhone ringtone. Transfer ringtones, music, photos, video, iBooks, iTunes files between iOS and PC. All-in-1: iTunes DRM remover, 2-way iPhone transfer, USB mounter, file converter. 100% success rate to transfer music to iPhone 8/Plus/X from macOS/Windows without using iTunes. Built-in with audio converter, support to import music to iPhone X/8/Plus with any music format, MP3, AAC, AC3, FLAC, OGG, WMA, ringtone, etc. Remove DRM protection from iTunes purchased music, convert M4B/M4P to MP3 and transfer iTunes purchased music between iPhone 8 and Mac/PC. iPhone music manager (create/edit/delete iPhone 8 songs) and iPhone ringtone maker ( make any song iPhone ringtone with 40 seconds). Two-way transfer tool to sync photos, music, ringtones, iBooks, podcast, iTunes purchases, iTunes U, etc. between iPhone 8/Plus/X and Mac/PC. To add music to iPhone 8/Plus or iPhone X, free download this iPhone 8 music transfer app on macOS or Windows PC first. Then check if your iTunes is the latest version. If not, update iTunes to the latest version. Don't misunderstand. This app just needs iTunes to detect your iPhone 8/Plus or iPhone X and it won't use iTunes to sync music to iPhone 8. So don't worry. 1. iPhone 8, iPhone 8 Plus or iPhone X with its original USB cable. 2. Latest iTunes version on Mac/PC. 3. Mac computer with Mac OS X 10.7 or higher; Windows PC with all operating systems supported. Note: If you wanna transfer music from MacBook/iMac to iPhone 8 (Plus) or iPhone X with iTunes DRM protected music, this iPhone music manager will automatically pop up a message to ask if you wanna decode these encrypted files. In case you wanna remove DRM from iTunes music, choose "Decode" and follow the guide of MacX MediaTrans to get ride of encryption step by step. If not, just choose "OK" to continue adding music to iPhone 8 or premium iPhone X with music formatted in .m4b or .m4p. 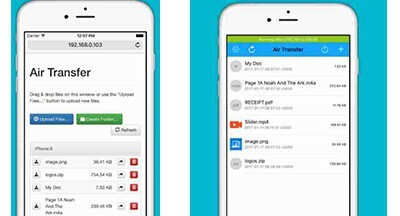 On top of using PC-based software to import music to iPhone 8, there is another option for your consideration - using iPhone transfer mobile apps. They also deliver a fantastic performance in music to iPhone 8 sync, as well as other files sync tasks. And you won't need to prepare USB cable if you choose them, just Wi-Fi internet connection enough. Well, if you're interested in mobile app, you can have a try on the below two iPhone transfer mobile apps. It's said in App Store that this iPhone transfer software is the first app to give your power to copy music from Mac/PC to iPhone 8 and vice versa. That's not the end. It still lets you transfer photos to iPhone 8 or iPhone X without any 3rd party help, only Wi-Fi connection needed. How about music management feature? You got it! 1. Wirelessly copy and move music and photos between iPhone 8/X and Mac/PC. 2. Create music playlist, move/rename/delete iPhone 8/iPhone X music. 3. Play music in a playlist and in background. As its name suggests, it supports you to transfer music to iPhone 8/Plus from computer via "Air" wirelessly. And it can do even more: move and transfer what you're seeing and playing on Mac/PC to iPhone 8 including music, movies, photo, documents, text memo, etc. via Wi-Fi. Wonderful? You can follow the steps to have a try. Step 1: Make sure your iPhone 8 and Mac/PC connected to the same Wi-Fi. Step 2: Tap WiFi button and input the iPhone 8 URL in web browser on your PC. Step 3: Drop music files on drop areas on the left side in your web browser. Done! 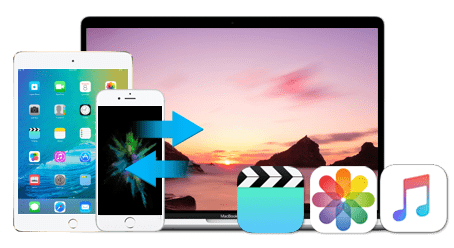 The above iPhone transfer mobile apps are capable of syncing music to iPhone 8 from Mac/PC computer. Yet, you need to know they can't transfer any music file to iPhone 8, cuz they don't have the built-in audio converter to convert WMA, FLAC, OGG, etc. to MP3 or iPhone ringtone. In addition, when it comes to transfer iTunes DRM-ed music files, they might not work so stably as MacX MediaTrans, for they lack iTunes DRM removal feature or DRM circumvention knack. So just pick out the suitable one to add music to iPhone 8 or share some useful tools you've used at comment section. Best iOS 11 iPhone 8 Music Manager to batch sync music, playlists, ringtone etc from Mac to iPhone 8/X/7s/7/6s/6/SE or vice versa, also manage music (create music playlist, edit info, rename/delete music songs, make iPhone ringtone).